The rendering of a substance into a powder form. One example is coal which has been pulverized or crushed into a fine dust in a grinding mill, and then blown into the combustion zone of a furnace where it burns rapidly and efficiently. The technique of breaking coal down into a fine powder for burning provides advantages; such as, a higher combustion temperature, improved thermal efficiency, and a lower air requirement for combustion. 1. The use of specific marks to clarify the meanings of written material by grouping words grammatically into sentences, clauses, and phrases: Punctuation does for writing and printing what pauses and changes of voice do for speech. The act of becoming a pupa (period of development of an insect that precedes the adult stage). 1. The removal of pollutants from something: The city's filtration plant is able to provide purification for large quantities of water every day. 2. The making of someone to be ceremonially clean: The priest invited his parishioners to participate in a ritual bath for the purification of their souls. 1. The development of pustules. 2. Breaking out into pustules. 1. An unintended consequence of an action, decision, or judgment that may complicate a situation or make the intended result more difficult to achieve. 2. The process of dividing or spreading out into branches. 3. Collectively, the branches of trees. 1. Exact thinking or the process of logical and methodical reasoning: Victor used ratiocination and the available evidence to solve the crime. 2. A reasoned train of thought which is rational, valid, and exact: When asked to explain why he invested so much in the company, Larry said he used all kinds of ratiocinations before he committed himself to get involved with the newly formed business. 3. 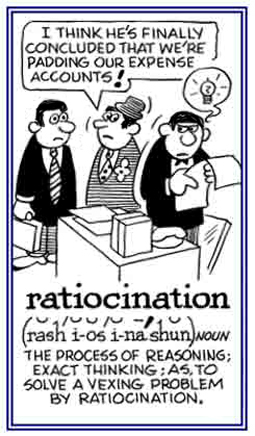 Etymology: from Latin ratiocincationem and ratiocincatio, "a reasoning", from ratiocincatu, the past participle of ratiocinare, "to calculate, to deliberate"; from ratio, "reckoning, calculation, business affair, procedure" + -cinari, which probably is related to conari, "to try". © ALL rights are reserved. 1. A confirmation of the validity or correctness of something previously established: "His re-election was a reaffirmation of his leadership skills." 2. Legally: An agreement that a debtor and a creditor enter into after a debtor has filed for bankruptcy, in which the debtor agrees to repay all or part of an existing debt after the bankruptcy case is over. For instance, a debtor might make a reaffirmation agreement with the holder of a car note that the debtor can keep the car and must continue to pay the debt after bankruptcy. 1. The process of understanding something, or the moment when this happens. Related words for this meaning of realization: knowledge, understanding, information, experience, expertise. 2. The process of achieving something that someone has planned or hoped for, or the moment when this happens. 3. The act of realizing or the condition of being realized. 4. Coming to understand something clearly and distinctly. Showing page 77 out of 96 pages of 1437 main-word entries or main-word-entry groups.